Customer Spotlight: StellarNet partners with Brewmetrix to create an in-house QC device for brewers - StellarNet, Inc.
Brewmetrix is a start-up company based in Nevada, using a patented approach to analyze liquids. The initial product, targeting small- to mid-sized breweries, is a complete QC system to measure any liquid property of interest to the professional brewer. The system is simple to use, yet incorporates cutting edge spectroscopy, machine learning and cloud computing to provide real-time lab-quality results. 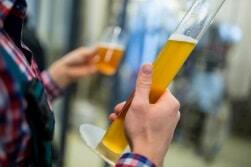 “We’ve been working with a mid-sized brewery in the Silicon Valley area to develop the initial product,” Sukuta said. The brewery market is attractive because brewers want to know specific properties of their beer during various parts of the process, which fit perfectly with Brewmetrix’ combination of spectroscopy and computational capability. Chemical properties important to brewers include: apparent extract (PEA), original extract (PEO), percent alcohol content, bitterness (IBU’s), color (Degrees Lovibond), pH, free amino nitrogen (FAN) and yeast viability. To use the Brewmetrix system, a small sample of the liquid to be tested would be drawn into a cuvette. The top of the shoebox-sized system (shown above) would be opened, and the cuvette placed in a slot inside. Once closed, the system will take the measurements needed to determine a variety of measurements/specifications, upload the data to the cloud- where machine learning is applied to identify and validate the measurements. The results are then relayed, in real-time, to the user’s device, which could be a phone app or email. The Brewmetrix product is part black box, part wireless device and part machine learning AI. 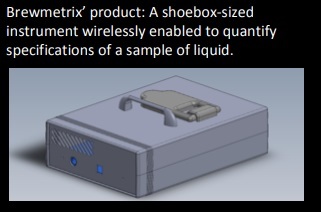 The actual Bremetrix instrument is the size of a shoebox, with one of StellarNet’s custom OEM spectrometers inside. “As you can tell, we’re not doing standard spectroscopy”, Sukuta said. Sukuta met StellarNet at a Photonics West show several years ago. He began speaking with the team about the mini rugged spectrometers, and eventually purchased one for the early stages of the Brewmetrix product. Eventually, more spectrometers were purchased as development continued and application-specific needs were identified. “We have so much to offer OEM integrators, designers, process managers, and manufacturers,” says David Parrino, StellarNet’s Director of OEM Business Development. “At StellarNet, we are willing to explore new territory with our customers and we don’t require a huge commitment to work with a designer to create something spectacular. The idea for Brewmetrix actually came from using spectroscopy to classify skin cancer cells. “That was part of my research,” Sydney said. 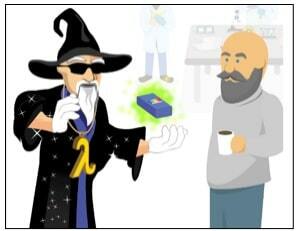 That chemical free lab-in-a-box idea continued to grow, and eventually grew into the Brewmetrix product. Approximately five years ago, the team started working with breweries to evaluate the product, and use the data obtained to apply for patents. For three years, the company has been acquiring data, tweaking prototypes and validating requirements. The return-on-investment (ROI) for a brewery using a Brewmetrix system will depend on how many external lab tests are required each month, but for the typical micro-brewery, the cost ROI will likely be less than twelve months. But truly, the most valuable ROI is to never lose a batch of beer to a failure in quality. The larger the production volumes, the higher the stakes are for the brewery. If a brewer can catch something early, they might be able to correct that mistake before it becomes a large investment of ingredients literally poured down the drain. Brewmetrix is initially offering its product to small- to mid-sized breweries, and is currently recruiting beta-test partners. However, the system can test any liquid, which includes drinking water. Therefore, the next target market for Brewmetrix is the water testing market. “Right now, the company is getting patents and becoming certified with the state of California, like stand-alone chemical labs are currently certified with the state. This will be necessary when the company begins to target water testing applications,” Sukuta concluded. 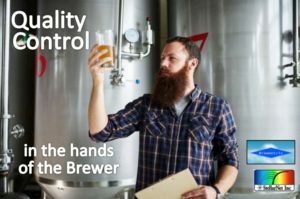 Interested in the Brewmetrix product? Brewmetrix plans to begin offering its product to mid-sized breweries beginning in 2019. The first Brewmetrix product should be available by the time of 2019 The American Society of Brewing Chemists in New Orleans, June 24–26, 2019. Brewmetrix is seeking small- to mid-size breweries interested in the Brewmetrix product to participate in initial product rollout before the product is released to the public. If interested, contact Sydney Sukuta, Ph.D. at sydney@brewmetrix.com. Interested in partnering with StellarNet? StellarNet values its partnerships with manufacturers and is happy to work with your development team to incorporate StellarNet’s compact rugged spectrometry systems into innovative products. With our recently introduced zAP2 capability, any StellarNet product can be connected to the Internet of Things for remote communication. Interested in incorporating spectrometry inside your next product? Contact David Parrino at 813.855.8687 ext. 20. StellarNet, Inc. manufactures precision fiber optic spectrometers for portable and multi-channel industrial applications, which enable low cost spectroscopy solutions. Our expertise in electrooptics, software design, and applications development, provides unmatched price performance in the global instrumentation market.